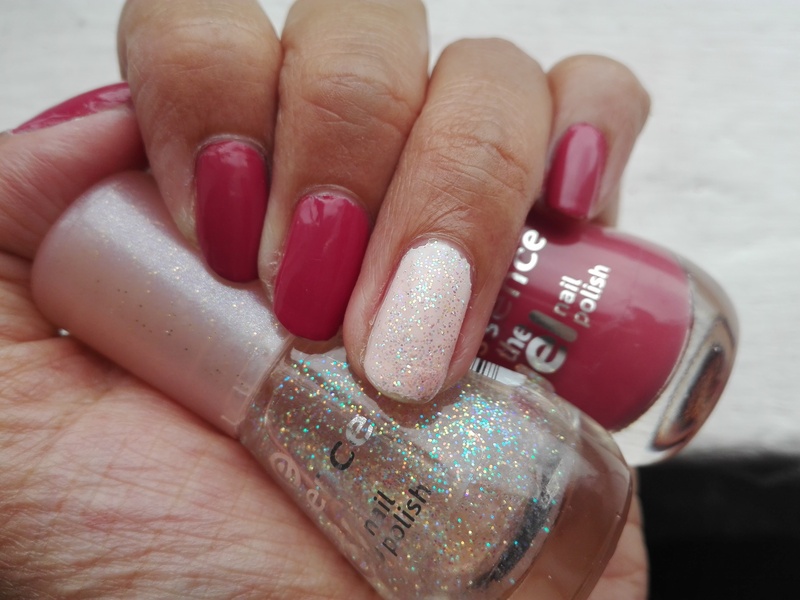 Glitter accent nails – Easy Peasy with Essence! Ever feel like: “I should probably do my nails today because they are starting to resemble that of someone who lives on a mountain, oh wait I don’t have the time, who am I kidding”? Well sister, you’ve come to the right place! I felt that way just the other day and decided to pull out my good ol faithful Essence The Gel polishes to give my nails a new zest for life. Glitter accent nails were a must! For this easy peasy glitter accent nails I used the lovely Essence The Gel 48 My Love Diary, a pretty deep rose color, coupled with one of my fav glitter polishes: Essence The Gel 06 Space Queen. But first, my base coat! I started off with the Essence Gel Look base coat which I love because it protects my nails from staining and also makes the mani last SO much longer! I then applied 2 coats of the lovely autumny #48 to all my nails except my ring finger. FYI this is Essence take on the Pantone Color of the Year 2015, Marsala. It is such an eye catching color and will pretty much suite any skin tone! I usually choose my ring finger nails as my accent nails because, spreadsheet brain, and stuff. It just makes logical sense up here *taps forehead*. But you can choose any nail to be your accent nail. I then painted a lovely light pink on my ring finger. For this color you could try Essence The Gel 05 Sweet as Candy. I topped this off with a couple of coats of my favorite Essence glitter polish. I love this glitter polish because so much glitter is applied with each stroke, without you having to layer and layer and layer to get the desired effect. Once dry (and they dry quite quickly!) I topped it off with the Essence gel look top coat and ta daaaa! Salon-look nails in 15 minutes. Good bye mountains! 🙂 Whatcha think?